TAMIYA 16006 BMW R75/5 POLICE TYPE (1/6) scale model kit! 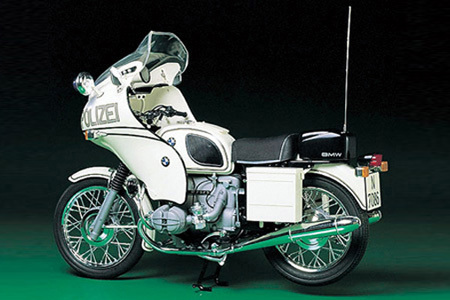 Big-scale kit of the BMW classic motorcycle, this time as a German police bike. Realistic soft rubber-like tires and leather-like seat. Working front fork and coiled spring rear suspension. Super-detailed B.M.W. opposed flat twin engine. All the extra police bike goodies. Very big and very impressive!